Cleaning improves the appearance and increases the life of your carpet, not to mention greatly improving your IAQ (indoor air quality). We use the industry’s most recognized and effective cleaning processes. Truck mounted hot water extraction, using the Butler System VII. We supply our own power and water from outside your home. There’s no soapy residue; it cleans deep and dries fast. All furniture is carefully removed and replaced on blocks and pads to prevent furniture stain; all spots are assessed and treated individually for heavily soiled areas, we have a state of the art RX-20 Rotary Jet Extractor! Rotary action actually flushes and then simultaneously removes all the bacterial laden soil through over 450 hot water injections per minute. 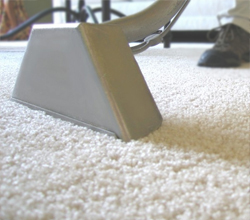 Restore your carpet’s color and resiliency.